I've been challenging myself lately to come up with cheaper & easier crafts that still look amazing, since I know John and I tend to get a little (or a lot) crazy with the power tools and complicated builds. SO, even though this is hardly new territory in the craft world, I thought it'd be fun to show you guys a simple, mega-cheap raygun build that just about ANYONE can make, no power tools required. In fact, if you already have the paint and glue, this build will only cost you two dollars. 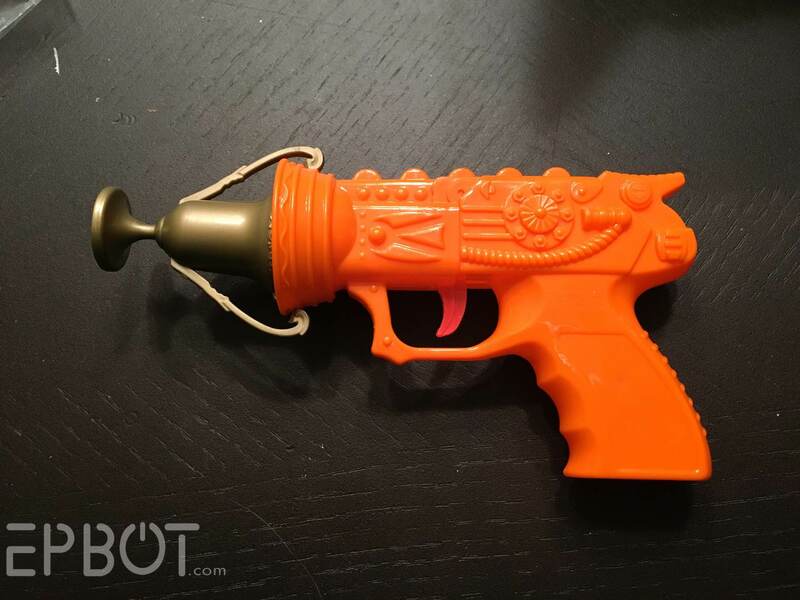 This gun has a plastic rod sticking out of the barrel that held the foam ball, so you can glue the trophy cup to that rod by filling it with either epoxy putty or hot glue. Cut apart a second trophy and use its handles to make two more brackets on the front barrel. If you're able to cut the second trophy's upper rim off, you can use that for the "dial" on the side of the gun, and the rest of the body as the little cap on top. Glue everything in place with E-6000 EXCEPT the "dial"; it's easier to paint that separately. 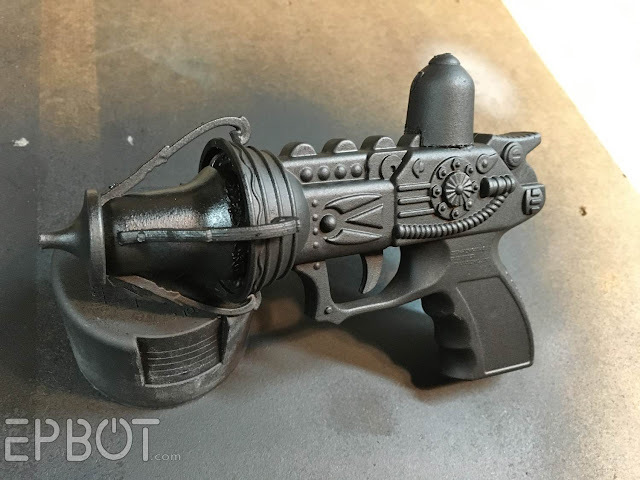 Spray the gun with a plastic primer, then a black base coat, if the primer isn't already black. Now the fun part: Rub N' Buffin'! 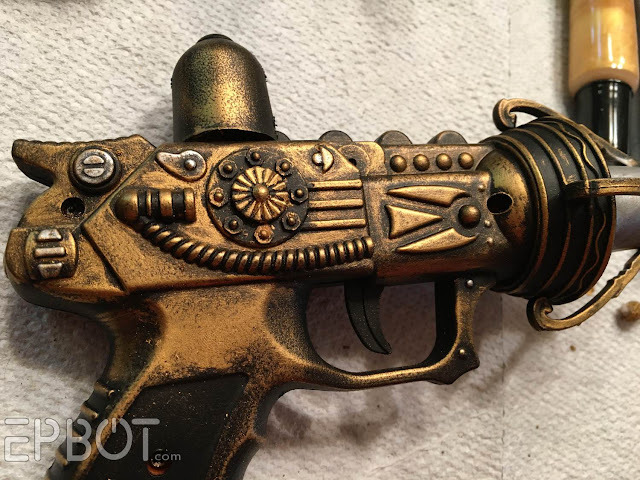 Start by covering the whole gun in a rough coat of gold wax. A small stiff paint brush works great for all those nooks and crannies. Next accent some of the raised sections with silver, and use nail polish to paint a few of the rivets to look like gems or indicator lights. You can also add some rivets to the handle with Bead In A Bottle Paint. This is the fun artsy part, so go nuts! The only extra material I used was a small strip of brass mesh around the top cup, since it looked a little plain. You could use craft foam, string, or even paper for a similar accent. 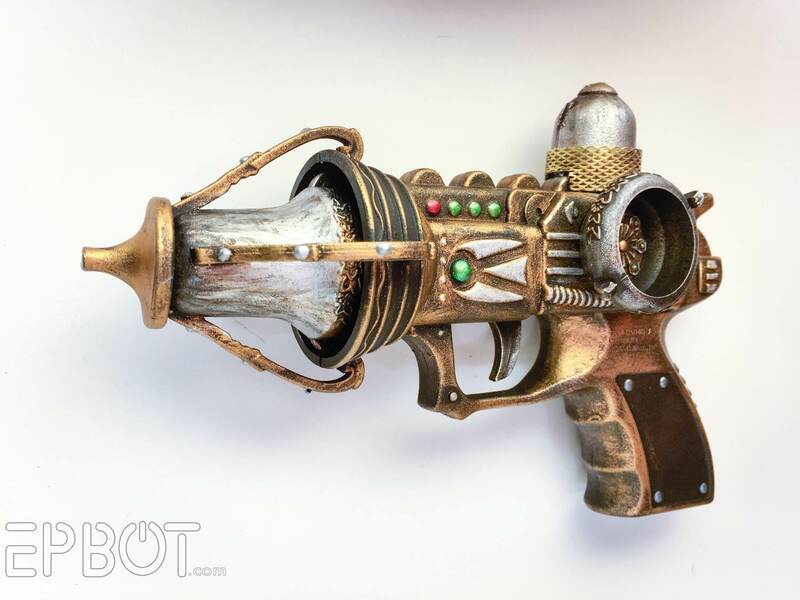 This raygun is perfect for steampunk cosplay, of course, but I think it's pretty enough to also be a display piece! Hang it in a shadowbox frame or on brackets on the wall, or maybe later I can show you how to make a simple cardboard display stand, so you can set it up on a bookshelf. I hope this gets some creative sparks flying! And as always, if you do try this, please share pics on the Epbot FB page so I can see! For my fellow Pinterest users - thanks for sharing the love! You just took two hunks of literal junk and made them into awesome. Truly, that takes talent (that I don't have!). The end result looks ab fab. Amazing! My brain would have seen those things and thrown them in the recycle bin. I'm actually in awe of your talent in SEEING the possibilities. And to go on the Dollar Tree theme - they have little nail gems and glitter that come in tiny glass vials - that can be used for another project later. One dollar gets 6 tiny vials full of glitters, etc. I used them for a necklace! Okay, I have no idea how you look at plastic junk and see such amazing potential. That, in itself, is a very unique skill. But, then, the execution is always just as awesome as the vision because you are such an artist and so skilled at making these dramatic transformations a reality. If I tried it, I would rage-quit a hundred times, and it would never get finished. But, somehow, you make me think that I could actually do this. I'm floored, as always. This is a very, very cool raygun. Maybe I'm planning a trip to Dollar Tree. OK, now THAT is pure awesomeness! Brilliant as always! I actually have a whole box of various dollar and thrift store water guns to do just this with, but haven't gotten around to it. May I ask what plastic primer you use and where you get it? I can't seem to find it in any of my local stores. I used a Valspar clear plastic primer, from Lowe's. I've had it in the garage for ages, though, so no guarantee it's still there; for some reason spray paints are constantly rotating out at stores, which can be frustrating! Who would have thunk it? Take 2 pieces of flotsam and jetsam, along with a small helping of paint and wax, add a some talent and patience and.....voila - brilliance! If I would have seen that gun at my Dollar Tree I would have already bought it to randomly attack my bf! These stores need to carry the same things! I find your creative mind inspiring and always love seeing your step-by-step tutorials. It definitely makes me motivated to start on a million projects at once. I will say, though, that I get very frustrated by all the tutorials I find touting themselves as being quick, easy, and, most importantly, cheap when, once you open them, they really aren't at all. This looks quick and easy, but it certainly costs more than $2. It may have only cost you $2 to get the things you didn't already have, but for someone looking for a good way into the geek craft world for the first time... this little guy hardly seems worth it once you add up the actual cost. Looking up all the things *I* would need to do this: $66! Could you do a post about a crafting starter kit of sorts? What types of products do you recommend to us newbies to get our versatile craft supply started? That way when these tutorials come along, they really do only cost $2. I'm not nearly as handy as Jen (the only power tool I own is a drill) but some of the craft essentials I always have on hand are a flat black spray primer that works on plastic-- one can will last for dozens of small projects--, a basic toolkit, an x-acto knife and cutting mat, paint brushes (good ones for even coverage, cheap ones for dry brushing, and foam brushes for large projects), hot glue gun, and a set of cheap poster paints. I'm also a big fan of the Folk Art metallic craft paint as a cheap and easy to find alternative to rub 'n buff. Yikes, $66? I believe you, but that does seem high for paint and glue. In situations like this I'm a big fan of using what you have or can get mega-cheap, so, for example, if you don't want to buy rub n' buff, try a $1 bottle of metallic craft paint. No Dremel? Use a serrated kitchen knife. No Bead-In-A-Bottle? 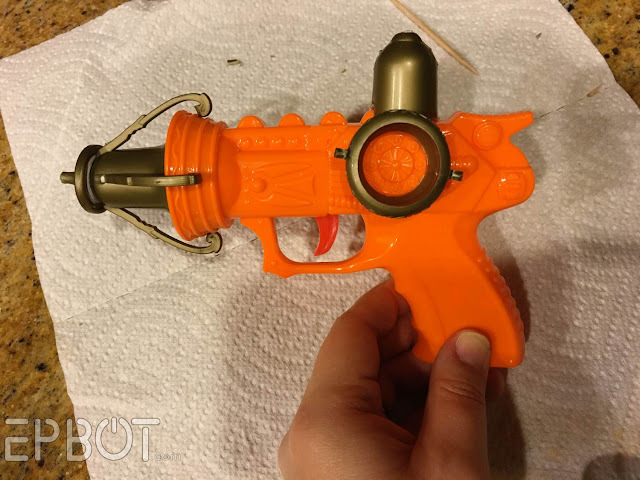 Try googly eyes or hole-punched craft foam or small balls of clay for rivets. It's all about getting creative with what you already have, not buying a ton of stuff you may never use again. Like Kim said, these items will last through dozens of projects, so once you stock up for your first crafting foray, you'll be mostly set for the future! Hey Jen, have you and John tried similar hacks with any of the Star Wars product that've been released since the new film came out? I ask because I've been hanging on to one of the Stormtrooper helmet candy bowls that Target stocked back around Halloween. I know there's potential for an awesome DIY, but I'm just not sure what to do with it. Planter? Lamp base? Serving bowl? I'm kind of new to the hacking store-bought objects scene, so I'm not sure where to go for ideas if I'm not following a tutorial. I haven't yet, no, though I've seen some sweet mods on Kylo Ren's light saber toy; essentially just adding Rub N' Buff, though one crafter added lights, too! For your Stormtrooper helmet, it'd probably look awesome if you just aged it a little with watered down brown paint, then displayed on a stand like a real helmet. Or go pop-art and paint it a bright glossy color. :D Or, yeah, candy bowl, lamp - sky's the limit! I love your easy prop tutorials! Quick tip for anyone that can't find rub 'n buff in the store (I had a last minute Vera prop to make and no time for shipping! ), Michaels carries a brand of craft paint called Folk Art and the metallic colors cover very well and look decently metallic. You still have to age it down, but it's cheap and easy to find. WOW. I am used to seeing amazing transformations by you here, but I was so not prepared for how incredible that turned out!! I am in awe. Awesome (as in, yes, actual awe) I found this on Facebook and was so happy when it let me back to here. The tiny trophies? Brlliant! YES! and now I have a reason to go buy "toys" at the dollar store! Of course, I'd also have to go to the craft store too... hmmm... oh well. Priorities! I found these at Dollar Tree today! I cannot wait to make mine! 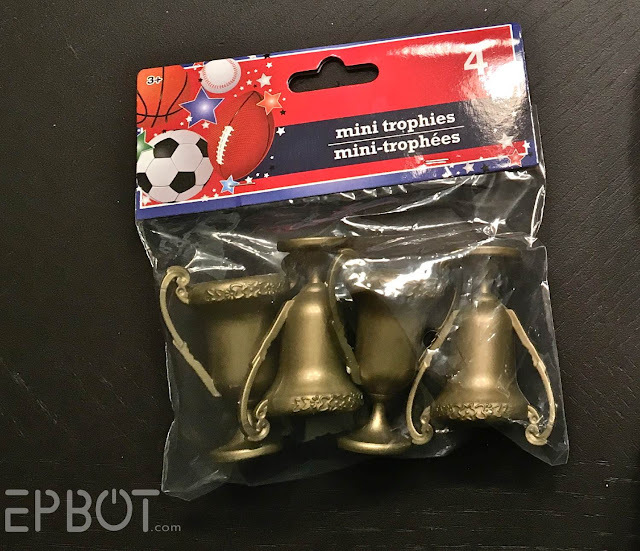 I got the trophys, and also a little plastic tea set that I thought might work instead of the trophys, so I bought 2 guns to make his/hers guns! The two most important thing for creating on a budget: seeing potential in everything – and be lucky enough to find stuff that fit together perfectly. :) Great idea for those who don't have a lot of money to spend on their passions and hobbies. 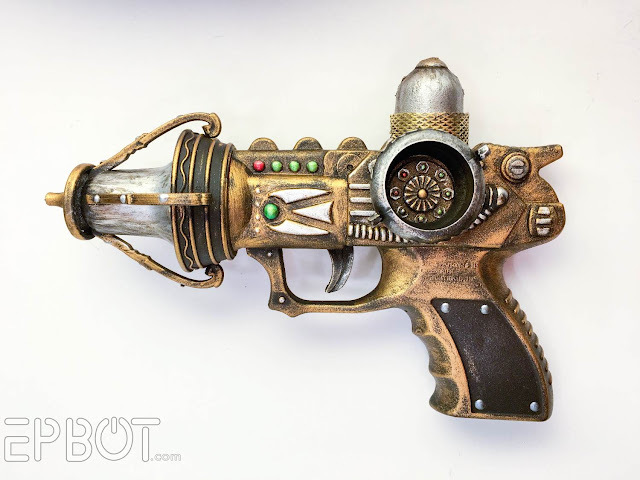 - First a steampunk-y pen (don't look at the price!). 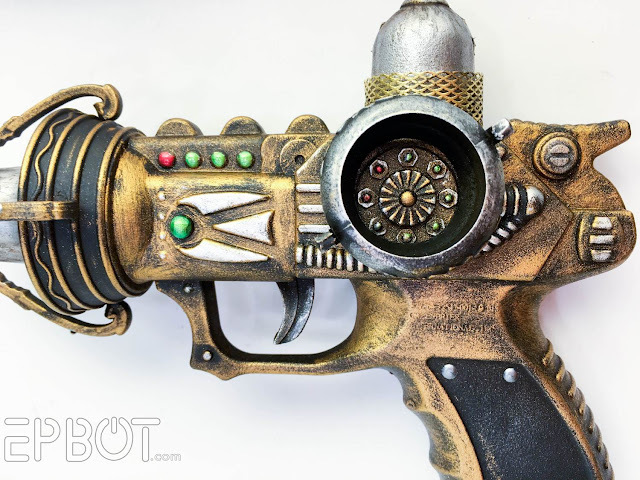 This one's in the same style, but with more metal strips and "rivets" (and there's another Titanic inspired one I don't have the link to, just search for Titanic on that website if interested). 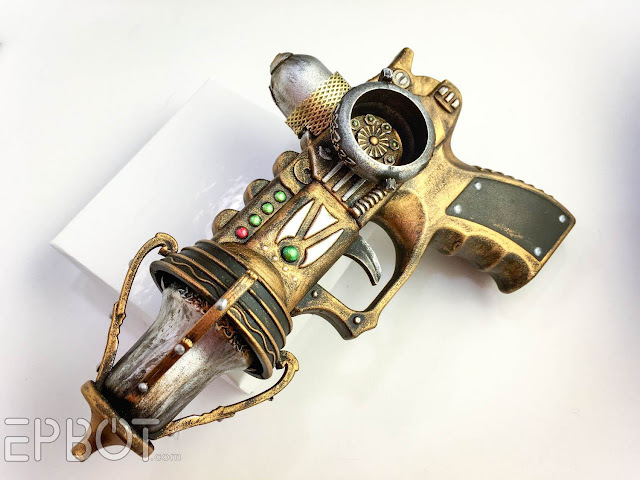 - And am I the only one thinking this Orb vase from Klong could be a (somewhat expensive) base for a steampunk makeover or (for a cheaper craft project) a DIY version? Link to Pinterest as I've got more pics of it on that pinboard. Do you think you could use Gold/Silver Tempera paint instead of the rub n buff? Trying to do this for a library craft with stuff we already have on hand. Absolutely! Just be sure to dry-brush it, so you get a similar effect. 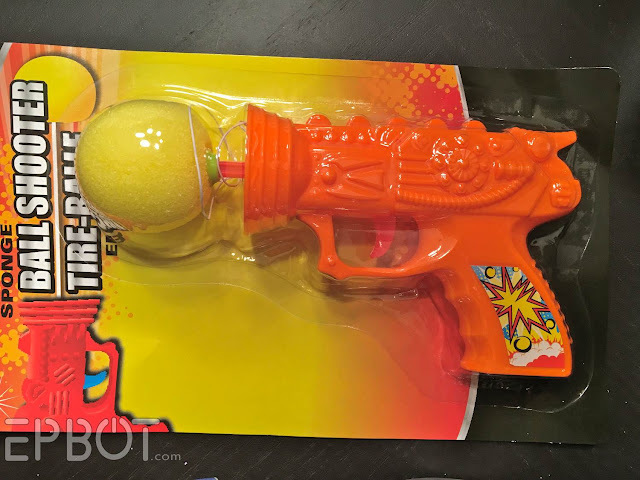 I found this same gun at Dollar tree, but can't find the mini trophies. I know this is an old post, but anybody else found these recently?